Guess who was my coffee mate today? 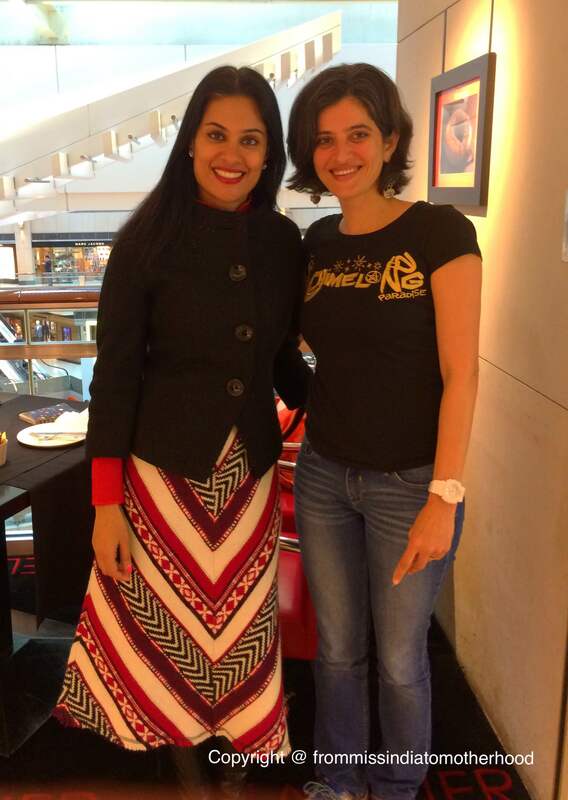 The beautiful, effervescent, banker by day, author an avid story teller and a mother of 2 growing boys, Bhakti Mathur! Bhakti is the proud creator of the beautifully illustrated “Amma tell me about….” picture books that you must have read and re-read to your kids every night. Yes she is the one who has made Indian mythology available to us in simple rhyming prose, making it possible for us to not only entertain our children with a bedtime story but also educate them! When I first approached Bhakti via Facebook messenger, I expected a lukewarm formal kind of a response. After all there was nothing significant that I had to offer, not much of an agenda in mind except the excitement to meet an author who had penned an amazing and successful series of children’s picture books, while managing a full-time career and raising her children. She surprised me with a quick response saying that she would love to meet me! Now I am pretty much comfortable meeting new people but I can’t deny that I was a bit nervous meeting her. Maybe it was because of her success or maybe it was because I had initiated the meeting and still didn’t have a concrete agenda in mind except some brief points of discussion jotted down on a piece of paper. Well, I shouldn’t have worried that much because once the customary exchange of business cards and the first few pleasantries were done, the conversation flowed easily from work to home to family to personal interests, it seemed liked we had a lot more in common besides our nationality and our motherhood status – our love for the outdoor, hiking, dogs, reading and the need to constantly reinvent ourselves – to name a few! Did you know that besides everything else that she does, she is now back to school pursuing an MFA (Masters of Fine Arts) degree in Creative Writing? 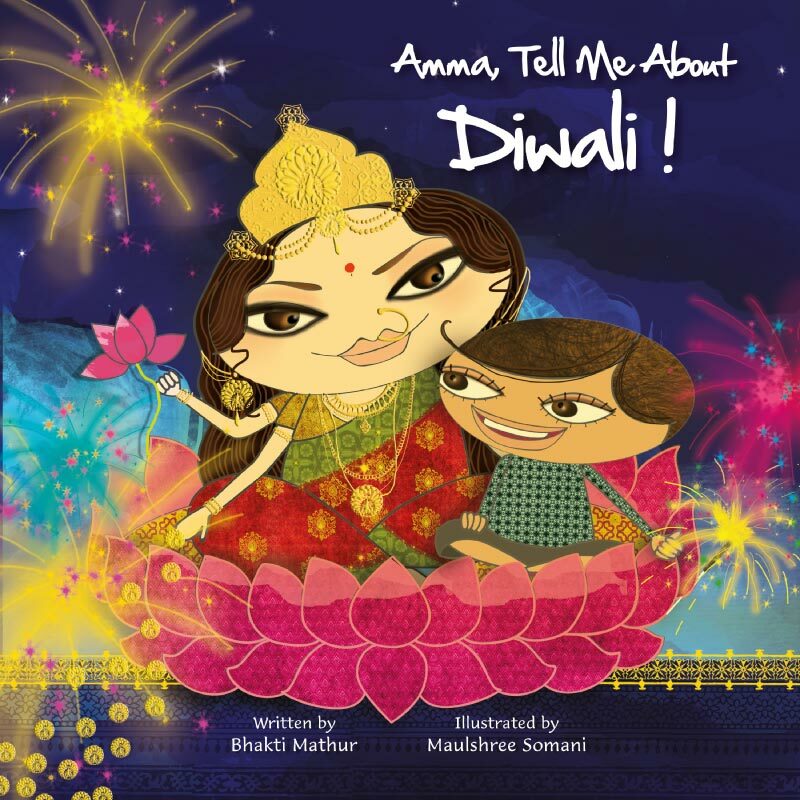 I first got acquainted with her book ‘Amma tell me about Diwali’ when I happened to put in my entry for a giveaway contest run by a Hong Kong parental portal. And I won! The book arrived by courier and I showed it to my younger son, who was 6 at that time. As usual at first he wanted to take a look at the book by himself. He sat and flicked through the pages. I could see that he was intrigued by the colourful, eye-catching illustrations, picking up the easier words and read them out loud and then he stopped on the page where Rama and Ravana come face to face with each other, looked up at me with a question in his eyes and without any prompt started counting the number of heads that Ravana had! When the book was finally handed back to me, I read it aloud to him. It is a beautiful story of a little boy Klaka who celebrates the festival of Diwali by lighting oil lamps, eating sweets with his friends and bursting fire crackers till it was time to go to bed. But instead of curling up and going to sleep, Klaka’s inquisitive mind wants to know more as he asks his mother, “Amma tell me about Diwali!” Now this is where the exciting part started for me because honestly although I’ve spent most of my life growing up in India I have never really questioned the purpose of our religious festivals. Coming from a Zoroastrian family we celebrated most of the popular festivals in India besides our own – Diwali, Holi, Id, Christmas – but I guess our celebration was limited to the fun element, especially as a child. So when I continued reading the book to my son I got very involved in the story, wanting to know more about the reason behind lighting those beautiful diyas and bursting those crackers. The story of Rama and Sita is beautifully depicted through pictures and words, but what I liked even more was the story of Goddess Lakshmi and how she blessed a true devotee rewarding hard work over just pleasing God by lighting diyas. One doesn’t expect a ‘moral of the story’ at the end of such a delightful children’s picture book, and yet there is one which gives a chance for us mums to explain the real significance of the festival and of life in general. I was happy that my children could relate to a lot of things shown in the book – the diyas, the festive lights, the fire crackers, the Indian “costumes” as they call them! We do not live in India and hence I take extra efforts in celebrating these festivals so that while they are living in a Western world they are still conscious of their tradition and culture. While I have many favourite picture books that I’ve read to my kids over the years I thought this one was quite special as the author has taken efforts in re-creating the bedtime stories shared by her Nani, adding in personal touches without making it too obvious. Did you know that Bhakti’s kids call her ”Amma” (for Mummy?) or that the little boy’s name Klaka actually came from her older son who when he was 2 and a half years old came home from his preschool one day and announced that his name was Klaka and just like that he wanted everybody to call him so? Well he must have forgotten all about it but trust a mother to imprint that memory into a book! Our coffee meeting ended with laughs and just before we parted, we stopped a passerby and requested him to take some photos for us, happily posing for the camera…..who knows the next time it could be the paparazzi! An interesting post on the whys of the religious aspect surrounding festivals. Your son has an inquisitive mind and it’s heart warming to see the new generation of parents entertain healthy discussion on religion. Thank you Vishal. Parenting is an ongoing challenge!